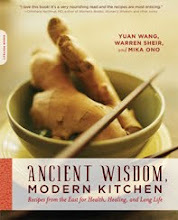 We really appreciate all the support that has been flooding in for Ancient Wisdom, Modern Kitchen! Thank you all so much! • Infodad.com, which calls the book "a feast for the mind as well as the palate"
• Bookviews by Alan Caruba, who is a charter member of the National Book Critics Circle. The review highlights Ancient Wisdom, Modern Kitchen, saying "There are many new cookbooks every year, I am always watchful for those that do not tread familiar paths"
• Supereco.com, which says, "In the face of increasing dissatisfaction with conventional medical care, the book is a powerful package offering a window into how other cultures stay healthy." • U.K. publication Healthy Soul, which notes that, thanks to the book, "The health-conscious cook could learn a lot and find a different approach to eating to supplement their wellbeing." • Another U.K. publication, Health and Fitness Magazine, which selected Ancient Wisdom, Modern Kitchen as Nutrition Book of the Month and notes it "offers a wealth of healing kitchen tips"
We'll let you know when podcasts become available. And thanks, too, to all of you who have become a fan of Ancient Wisdom, Modern Kitchen on Facebook and who took the time to review the book on Amazon ! Just to clarify -- we are TAPING the interview with Warren this Friday, but AIRING it on Sunday, probably at about 11:15 central. Thanks for the clarification, Stu!